Do we need to re-think the design of terraced houses? The need to build houses economically and at high density has led many architects to re-consider the layout of the terraced house. For example, in Britain in the 1950s, three architects – Stanley Amis, William Howell and Gilliam Howell – designed six terraced houses in Hampstead in London with a very narrow frontage of just 3.65 metres each. You can find floor plans for the houses on the excellent Modern Architecture London blog. The houses were influenced by the design of Le Corbusiers’s housing block in Marseille which featured apartments with a width of just 3.66 metres. The pressure to build at high density and to fit as many homes as possible onto plots of land means architects have to think harder about maximising “usable space” in and around the home. What does this mean in practice? It could mean eliminating circulation space such as hallways if this frees up more useful space for other purposes. Many modern homes have very small or non-existent front gardens. But front gardens aren’t just “unusable” space. They play an important role because they act as a buffer between the public realm of the street and the private realm of the home. Similarly, hallways provide a transition from the public space outside the home and the privacy of the rooms inside the home (they also act as a “meet-and-greet” space for visitors). 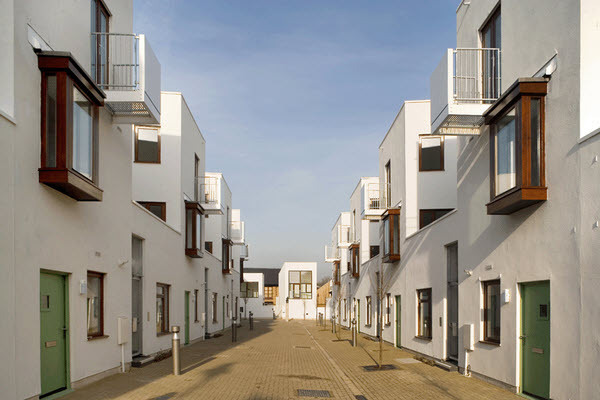 When architecture firm Peter Barber Architects designed the award-winning Donnybrook Quarter housing development in East London, they placed the houses across an intimate pedestrian-scale street. The design encourages (one might even argue forces) residents to get to know one another. Terraced houses in Hampstead, London. Donnybrook Quarter in East London (completed in 2006). Photo from Peter Barber Architects. The street is a public space, but it has a semi-private feel due to its intimate scale. It encourages “eyes on the street” but also a feeling of “defensible space” i.e. a sense of ownership or territorialism towards the street by the residents. The ground floor dwellings open straight onto the street and there are no hallways. Not everyone will feel comfortable with these design decisions. There are, of course, plenty of Victorian terraces where the front door opens directly onto the street. Nevertheless, I think most people would prefer some distance between their homes and the pavement or footpath outside. Ground floor plans for Donnybrook Quarter. The staircase at the side of each ground floor dwelling leads to a upper floor maisonette. This gives both ground floor and upper floor dwellings their own street entrance. Interestingly, a 1970s GLC book about housing layout states there are two universal needs for any housing developement: the need for community and the need for privacy. You can see how the Donnybrook development tries to articulate these needs. Has it succeeded? Only the residents can tell us. Architecture firm Proctor and Matthews designed a series of terraced homes in two, three and four bedroom layouts for a development in Newhall near Harlow. These houses do not feature the traditional front garden, but the terraced houses include an entrance canopy that provides something of a transition between public and private space.